Turn back the hands of time with an exclusive, non-surgical combination of soft tissue fillers to erase deep under eye hollows, smile lines, and jowls, restore soft natural volume to the cheekbones, and re-contour aged blunted jawlines. Finish off with BOTOX® Cosmetic to relax tired, frustrated-looking eyes, smooth out forehead wrinkles, and lessen the appearance of crow’s feet. How is a Liquid Facelift different from a surgical facelift? It is an injectable procedure, not surgery. The Liquid Facelift is an entirely nonsurgical procedure performed in the office setting under local anesthesia. A specific combination of soft tissue fillers are used to rejuvenate all areas of the face in a single sitting, and that combination is customized to your individual signs of aging and to your personal aesthetic goals. The procedure takes about 90 minutes, and the results are visible immediately. There is a minor risk of mild bruising and swelling, but most patients look perfectly natural within 24-36 hours after the procedure, and there are no scars involved with the Liquid Facelift procedure as there are with a surgical facelift. It costs less than surgery. A Liquid Facelift is about 1/4 of the price of a surgical facelift, and while neither are inexpensive, the Liquid Facelift is significantly cheaper. Is is safer than surgery. Because is not a surgical procedure, the Liquid Facelift is inherently less risky than a surgical facelift. The most common and relevant risks with a Liquid Facelift procedure are minor bruising and swelling, while a surgical facelift has a longer list of possibilities. The results are very impressive, but not as dramatic as surgery. A Liquid Facelift performed by an injectable specialist like Dr. Vendemia can produce extraordinary results, but those results will never be as good as the results from a surgical lift. If your signs of aging are severe, a surgical list may be the best choice, but even in situations like that, you will always have a choice about which procedure is best for you. If your primary aging concern is related to a saggy neck, a surgical facelift is by far your best option since the only area that cannot be treated with a Liquid Facelift is the neck. The results are temporary. A surgical facelift will last most patients about 10 years, but a Liquid Facelift generally needs to be repeated about once per year. That being said, the Liquid Facelift does not require anesthesia, and has essentially no downtime, so the fact that it needs to be repeated may or may not be a significant consideration for most men and women. What are the most common signs of aging that the Liquid Facelift treats? Forehead wrinkles, sagging brows, and tired eyes. Botox is used to relax tight muscles around the brows and eye areas to lessen the appearance of deep wrinkles and creases, and to reduce the appearance of tiredness and frustration that results from droopy brows and heavy upper eyelids. An average dose of 30-50 units is used in women, and 50-85 units in men. Smile Lines (Nasolabial Folds). The smile lines, or laugh lines, are filled and softened with a soft tissue filler like Juvederm Ultra Plus or Restylane. Usually 2-3 syringes are required for moderate to severe folds. Marionette Lines. Marionette lines are smoothed with Juvederm Ultra or Restylane to recontour the lower part of the mouth and chin. Usually one syringe of product is enough for this area. Chin, Jowls, Jawline. This is another area, like the marionette lines, that tends to be overlooked by patients who are having filler injections for the first time because all of the focus is usually on deep smile lines. The groove between the chin and the lower lip also deepens with age, and as jowls grow larger, the jawline looses is youthful smooth line. One to two syringes of filler can go a long way to restoring a young appearing chin and jawline, and disguising the jowls. Juvederm Ultra Plus or Radiesse usually works best for this area, and 1-2 syringes are usually necessary depending on how heavy the jowls are. Cheekbones. As the soft tissue of the face descends as we age, it leaves our cheekbones bare and changes the shape of our faces from a youthful heart to an older looking square. Restoring the natural volume of the cheekbone with injectable filler is one of the best ways to take several years off by changing the shape of the face back towards a heart, and when done properly, cheekbone enhancement is one of the most subtle ways to look and feel younger. Adding volume to the cheekbones also provides a subtle lift to the cheek and jowls, which is why this is the most important step of the Liquid Facelift procedure! Dr. Vendemia’s favorite product for the cheekbones is Juvederm Voluma because it offers a truly excellent lift and creates a beautiful look to the cheekbones. Make sure to ask him if you are a Voluma candidate. Under-Eye Hollows. Under-eye hollows are probably the first thing that men and women notice as they age. Some people even notice these as early as their late 20’s. The good news is that they are easy to treat with soft fillers like Juvederm Ultra or Belotero. One syringe will usually be enough to treat both under-eyes, but the best result will come from treating the entire cheekbone and under-eye complex at the same time, which usually requires 2 to 4 syringes total. Temple Hollows. The temples are not commonly considered when trying to look younger, but they are a significant contributor to an aging face. The temples can become quite sunken just like the cheeks, so restoring some volume here is just as effective. One syringe of Radiesse or Juvederm Voluma for each temple is usually enough to make a noticeable difference. How soon will I see the results after a Liquid Facelift? The answer to this question depends on the specific combination of products used. Dr. Vendemia most commonly uses some combination of Juvederm Ultra Plus, Juvederm Voluma, Belotero, and Radiesse, so the goal is that this procedure only needs to be repeated once per year. Dr. Vendemia is a leading cosmetic surgeon in New York City with a reputation for custom care and beautiful results. The LiteTouch Liquid Facelift offers results that are comparable to more invasive facial rejuvenation procedures without the expense, downtime, or discomfort of surgery! 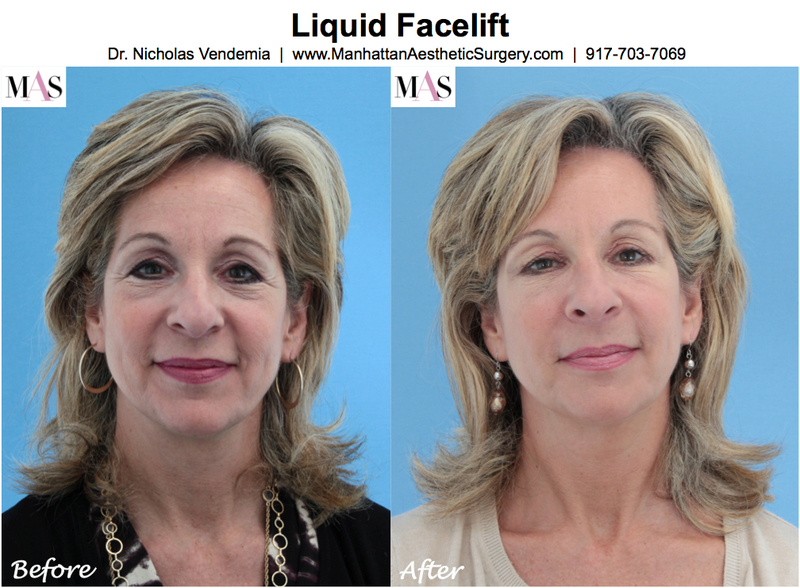 Dr. Nicholas Vendemia performs Liquid Facelifts for women and men in the New York metro area. For more information about Juvederm or other injectable procedures, please contact us online to schedule a consultation or call our office at 917-703-7069. If you haven’t already done so, check out the amazing results in our Before & After Injectables Photo Gallery by clicking on the image below. We’re looking forward to meeting you!